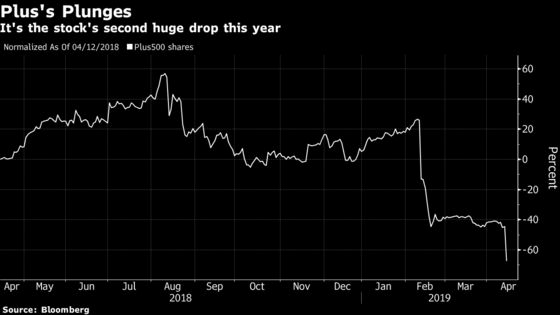 (Bloomberg) -- Plus 500 Ltd. plunged as much as 44 percent after the spread-bettor said that it lost about $28 million on wagers against clients in the last quarter, dragging down an industry already reeling from increased regulation. The London-traded company also blamed “extremely subdued” markets for a 65 percent slide in revenue compared with the previous quarter. “It is impossible to predict market conditions for the rest of the year and therefore too early to draw conclusions about the full year outcome,” Plus500 said in a statement. The news adds to pressure on Plus500, which sponsors Atletico Madrid soccer club, after it revealed in February that its annual report contained a drafting error about trades with clients. The spread-betting industry is already struggling with European rules introduced last year curbing leverage to protect retail investors -- a change that was partly responsible for a reduction in Plus500’s active customers from 218,000 a year ago to fewer than 98,000. Brokers are restricted in how they sell and market contracts for difference, while customers face caps on how much they can borrow and lose. Shares in Plus500 recovered some ground to trade 24.5 percent lower at 9:13 a.m. The stock is now down 60 percent year-to-date. Peers IG Group, CMC Markets and Playtech Plc also fell on Friday. Justin Bates, analyst at Canaccord Genuity, said first quarter trading was “extremely poor’’ after the company disclosed revenues of $53.9 million, 40 percent below Canaccord’s expectations. “There’s no quality of earnings for investors to rely on as you are subject to whether clients win or lose,’’ he said in an interview. Adding to the industry’s woes, Australia’s financial regulator said overnight that it intends to crack down on spread-betting firms operating in its shores that are circumventing European rules.